I wear makeup at least 5 out of 7 days, every single week probably for the past 10 years or so now and only found out about the importance of a setting spray just over two years ago when I was getting my makeup done for my wedding. Makeup looks SO different when you start with a very clean “canvas” and end with a really good setting spray. 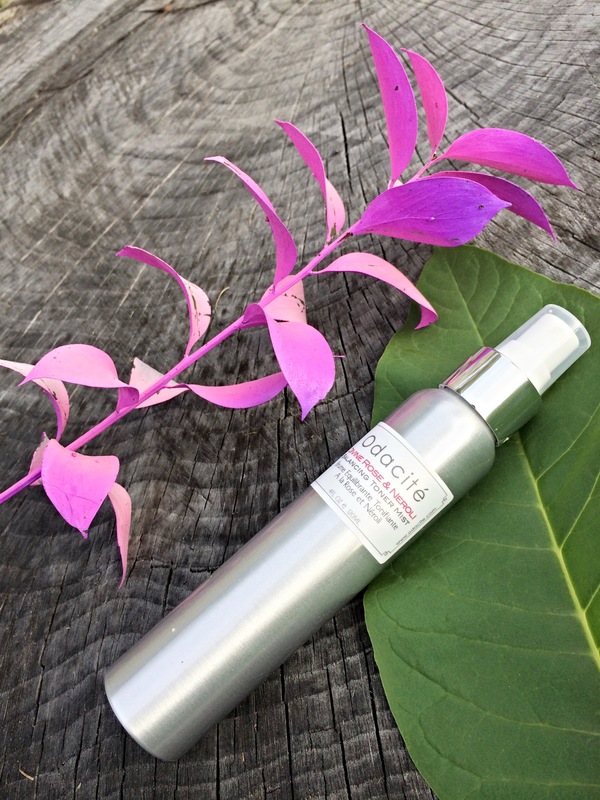 I found a product from the company Odacité that doubles as a toner & works perfectly as a setting spray. They offer three different toners: Divine Rose & Neroli, Aloe & Immortelle and Mint & Green Tea. I use the Divine Rose & Neroli toner because I have normal/combination skin. It balances skin, minimizes the appearance of pores and revitalize overall complexion. The rose-water balances sebum production, aloe vera juice heals skin and keeps it moist and aspen bark extracts minimize the appearance of pores. I use this product AT LEAST three times a day, it smells SO amazing and leaves my skin glowing! It’s great to use right after cleaning your face, to set your makeup or just to refresh your face throughout the day. Also, I love finding companies that have meaning behind them, have purpose. I feel like it’s VERY important for a company to not only care about their products, but their customers. Valerie Grandury created Odacité after battling breast cancer and realizing she needed to detoxify her environment, starting with a raw diet and leading to personal care products. All of Odacite’s products are made from the freshest, purest, natural and organic ingredients. NO preservatives and NO chemicals. Oh and each one is labeled with a date so you don’t have to worry about how old your product is or how fresh it is! YES!